Irish Gin of four seasons. Saint Kevin, an Irish Saint born in 498 in County Wicklow in Ireland, lived most of his life in the valley of Glendalough as a hermit. After growing tired of his followers, he moved to Glendalough, lived in a man-made cave, and slowly built up civilisation. It is Saint Kevin’s pioneering spirit and strength of character which inspired the five founders of the Glendalough Distillery to revive the heritage of craft distilling in Ireland. They started off with traditional Irish spirits; Poitin and Whiskey, before venturing into Gin. 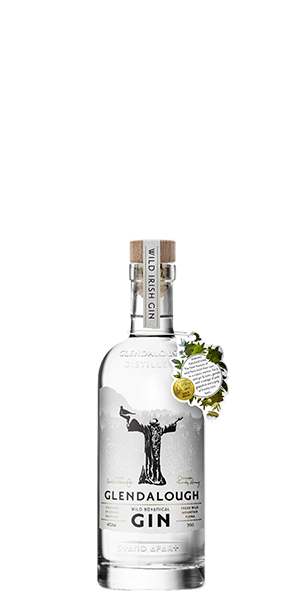 Glendalough started producing four different varieties of their Gin; one for each season, with the first being released in Summer 2014. The team forages for local botanicals, distilling them the next day when fresh to keep all of their essential oils (where many Gins would use dried). Each of the four Glendalough Wild Gins have the same base spirit and botanicals (including juniper, coriander, orris root, lemon and orange peel), with one dominant botanical to capture that season. More recently the team has launched Glendalough Wild Botanical Gin - capturing all four seasons in one bottle. Made with liquorice root, lemon, elderflower, raspberry, blackberry leaves, wild rose and more, it’s a wildly complex Gin. Slow distillation (which takes 24 hours from start to finish) ensures the flavors teased out from the fresh botanicals give the best depth of flavor. This Gin is fresh and floral on the nose, citrus and mellow fruits give way to warming spices for a long finish. What does Glendalough Wild Botanical Gin taste like? The Flavor Spiral™ shows the most common flavors that you'll taste in Glendalough Wild Botanical Gin and gives you a chance to have a taste of it before actually tasting it. Grassy, floral with fruity notes. Warming spice, long and just sooo smooth. I have not been a fan of Gin for a long time, this was my first experience with botanical gin and it has made me a fan all over again. Very enjoyable Gin I must say. Work's for me. A wonderful gin, I love how fresh and clean this tastes. Absolutely excellent gin. Fresh and lively herbals, beautiful alone or with a craft tonic. A gin for all. A mouthfull of Outdoors. Fresh. I’m afraid too many people will discover it. Very nice, very floral. Not sure if the wild botanicals impart something distinctive, but the idea of local botanicals in a local gin is fantastic! Hands down, this is one of the best gins I've ever had. Incredibly smooth with beautiful floral notes. Some Gins you keep for yourself. This is mine. This is one of my favorite gins. I have tried this one as well as the Spring and Autumn botanicals versions and love them all. Wish Glendalough would continue to push out a variety of gins! This gin is really special! I’ve tasted many and this one is one of my favorites. I love the botanical flavors and the clean finish. Yum! I like gin, ever since I was a bartender years ago. My favorite was Tanqueray with an occasional Beefeater for mixing, but my first bottle of Glendalough Wild Botanical is so amazing that I may never share it! Thanks so much for allowing me the opportunity of becoming a member of Flaviar! Hands down the best gin I’ve tasted. Fresh, different and super smooth. The first gin that I feel I could really sip by itself. Even if you’re not generally a gin person give this one a try.